WOBURN, Mass. (BUSINESS WIRE) — Ethos Veterinary Health (Ethos), a leading independent veterinary health company, just finalized its third acquisition since December 2017, expanding its presence across the U.S. Integrative Pet Care in Chicago, Veterinary Emergency + Referral Center of Hawaii, in Honolulu, and Atlantic Street Veterinary Hospital Pet Emergency Center in Roseville, CA, have recently joined Ethos. Ethos has significantly expanded its scope and now operates 17 veterinary specialty hospitals, which includes a team of more than 360 clinicians, and a suite of complementary services. These include Ethos Diagnostic Science, a San Diego-based reference lab with new locations in Boston and Denver; Ethos Veterinary Compounding, a compounding pharmacy; and VetBloom, an innovative online learning platform. With its unique approach of integrating clinical medicine with science and education, and focus on vision, values and culture, Ethos is a great option for veterinary practice owners who are looking to join a larger organization or for a retirement option. A contributing factor to Ethos’ momentum is the increase in practice owners seeking out Ethos. Ethos is currently an active buyer and interested parties can contact Brian Cassell at bcassell@ethosvet.com for more information. WOBURN, Mass.–(BUSINESS WIRE)–The American College of Veterinary Internal Medicine (ACVIM) has entered into a partnership with VetBloom, the digital learning ecosystem from Ethos Veterinary Health (Ethos). This multifaceted partnership will actualize development of a Virtual Learning Environment for ACVIM and its members and allow collaboration on the development of eLearning modules. In addition, VetBloom will develop an integrated online portal for tracking and reporting of data related to the Maintenance of Credential (MOC) program for ACVIM Diplomates, as well as for tracking of Resident Specialty training and credentials. The ACVIM and VetBloom teams will launch the platform following the 2018 ACVIM Forum, with additional functionality and content to be added throughout the remainder of the year. VetBloom is an innovative learning ecosystem featuring the expertise of the finest veterinary professionals in the industry, along with cutting-edge, online instruction. Team members learn through direct and virtual instruction, interactive case-based scenarios and 3D simulations. VetBloom allows veterinary professionals to advance their skills from anywhere in the world. For more information visit vetbloom.com. Phineas, a 7-year-old Flat Coated Retriever, was presented to Peak for evaluation of left thoracic limb lameness of 10 month duration. During physical examination, marked soft tissue swelling and decreased range of motion of the left elbow was noted. Radiographs of the left elbow showed marked bone proliferation associated with the elbow joint. The radiographic and physical exam findings were most consistent with a mass arising from the elbow joint. 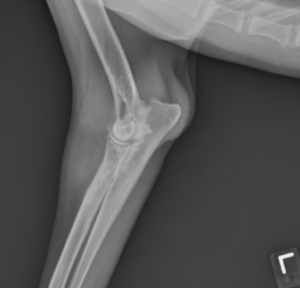 Since neoplasia was the top differential diagnosis for a mass in the elbow of a middle-aged Flat Coated Retriever, thoracic radiographs were ordered. No evidence of intrathoracic metastasis was observed. A CT scan was performed next, and a mass enveloping the left elbow was confirmed. An incisional biopsy of the mass was taken prior to recovering Phineas from anesthesia. The histopathologic diagnosis was a sarcoma, and the pathologist was most suspicious that this tumor was of histiocytic origin given the signalment of the patient, tumor location, and the microscopic features of the biopsy. The mitotic index was 14, and there was marked anisocytosis and anisokaryosis with multifocal cytomegaly, karyomegaly, and multinucleated giant cells. The neoplastic cells extensively invaded the adjacent skeletal muscle. Other differentials for a tumor arising from the joint that were considered included a synovial cell sarcoma and other soft tissue sarcomas. Phineas was referred to the Oncology Service for consultation regarding the biopsy findings. Special stains were ordered to confirm the diagnosis of histiocytic sarcoma. The neoplastic cells were diffusely positive for both CD18 and CD204, which are two markers for cells of histiocytic origin. Histiocytic sarcoma (HS) is a malignant neoplasm of histiocytic cells. Dog breeds that are overrepresented with this neoplasm include Bernese Mountain Dogs, Flat-Coated Retrievers, and Rottweilers.These tumors can present in two main forms: localized and disseminated. The localized form involves a single primary tumor arising from a joint, cutaneous or subcutaneous tissue, lung, or essentially anywhere in the body. Patients with the disseminated form present with an advanced stage of disease and often with multiple visceral organs involved. Most commonly the liver, spleen, lungs, and lymph node are affected. The prognosis for dogs with the localized form of the disease is significantly better than the disseminated form. The localized form of HS has been shown to have a median survival time beyond 500 days following treatment compared to several months with the disseminated form. Commonly, patients with the disseminated form present with signs of systemic illness including weight loss, anorexia, vomiting, and occasionally, fever. Despite the superior prognosis, localized histiocytic sarcomas still have a high risk of metastasis to lymph nodes, lung, liver, spleen, and other organs. Given the high risk of metastasis, an abdominal ultrasound was recommended for Phineas. No evidence of abdominal metastasis was observed. Since Phineas’ disease was confined to his elbow based on the staging tests, a left forelimb amputation was recommended followed by chemotherapy with CCNU (lomustine). Periarticular forms of HS have been shown to have a significantly improved prognosis over HS arising from other organs. Periarticular HS that has not metastasized has been shown to have a median survival time of 980 days following treatment in one study. While amputation is the treatment of choice, palliative radiation therapy can also be used to help control pain in patients that are not candidates for amputation. CCNU is the chemotherapy drug of choice for HS. The response rate in the gross disease setting has been reported to be 40-60%. For patients that develop progression of their disease with CCNU, doxorubicin with zoledronate (a bisphosphonate) is another option. This combination of drugs has displayed synergistic cell death in in vitro studies evaluating HS. Anecdotally, impressive responses have been observed with this drug combination in practice as well. Phineas recovered well from his forelimb amputation despite concurrent orthopedic diseases (elbow dysplasia and history of a TPLO on a hind limb). His orthopedic diseases were managed with a combination of carprofen, gabapentin, amantadine, and Dasaquin. Following limb amputation, Phineas was started on chemotherapy. He received 6 doses, which were administered every 3 weeks. Restaging tests with thoracic radiographs and abdominal ultrasound were performed in the middle of the chemotherapy protocol and again at the end. No evidence of metastatic disease was observed at either time point. We have continued to monitor Phineas with these staging tests every 3 months. Phineas was diagnosed in August 2016 and was clear of disease on his most recent staging tests. Withrow, S.J., D.M. Vail, R.L. Page. Small Animal Clinical Oncology. St. Louis: Elsevier Saunders, 2013. Print. Klahn, SL, BE Kitchell, NG Dervisis. Evaluation and comparison of outcomes in dogs with periarticular and nonperiarticular histiocytic sarcoma. J Am Vet Med Assoc 239.1 (2011): 90-96. Skorupski, KA, et al. CCNU for the treatment of dogs with histiocytic sarcoma. J Vet Intern Med 21.1 (2007): 121-126. Skorupski, KA, et al. Long-term survival in dogs with localized histiocytic sarcoma treated with CCNU as an adjuvant to local therapy. Vet Comp Oncol 7.2 (2009): 139-144. Hafeman, SD, D Varland, SW Dow. Bisphosphonates significantly increase the activity of doxorubicin or vincristine against canine malignant histiocytosis cells. Vet Comp Oncol 10.1 (2012): 44-56. Daniel, a 3 year old, male, castrated, Golden Retriever presented to Dr. Kurt Schulz at Peak’s Surgery service for evaluation of a 2 month history of worsening lameness of the right hind leg. Radiographs of the right knee joint had only shown some soft tissue swelling and no other abnormalities. Daniel had no other clinical problems. The lameness improved on Rimadyl. Physical exam revealed a non-weight bearing lameness of the right hind leg with swelling of the right knee joint. The only other abnormality on physical exam was a II/VI right systolic heart murmur. Dr. Schulz performed joint taps which showed neutrophilic inflammation of the right knee joint and normal joint fluid cytology in the other joints (total nucleated cell count of 19,490 with 55% neutrophils, 30% large mononuclear cells and 15% small to intermediate size lymphocytes). Culture of the joint fluid was negative. A vector borne disease profile was submitted to NCSU and was negative for all tested diseases, including tick-borne diseases. Daniel was transferred to Dr. Marielle Goossens in the Peak Internal Medicine service for further work up of the neutrophilic mono arthritis. A search was started for an underlying disease that could have triggered the neutrophilic inflammation in the right knee joint. A full profile and urinalysis at Idexx only showed a mildly increased ALT of 145 and the remainder of all values were normal. An ultrasound of the abdomen was normal. Cardiac work up by Dr. Don Brown showed mild ventricular hypertrophy and some aortic valve insufficiency, but no evidence of endocarditis. Systemic blood pressure was normal. A Blastomycosis urine antigen test was sent to Mira Vista laboratories and showed a weak positive test, below the limit of quantification. After speaking with Mira Vista Diagnostics about these results, Blastomycosis and Histoplasmosis serum antibody EIA testing was performed. While waiting for these results, repeat radiographs were obtained of the right knee joint. They showed right stifle effusion and evidence of active osseus lesions at the distal lateral metaphysis and increased medullary opacity, which had not been observed on radiographs 2 months prior (fig. 1). A CT and bone biopsy of the right knee joint were performed. Histopathology showed neutrophilic to granulomatous osteomyelitis with new bone formation and osteolysis. Special stains were performed for fungal organisms and showed low numbers of broad based budding fungal organisms, consistent with Blastomyces Dermatitidis (fig. 2). Fig. 1: Radiograph of the knee joints showing the subtle bone changes in the right knee joint. Fig. 2: Histopathology of the bone biopsy showing the broad based fungal organisms consistent with Blastomycosis Dermatitidis. At the same time as the biopsy results came back, the antibody titers also came back from Mira Vista Diagnostics. The Blastomycosis antibody was negative, but the Histoplasma IgG antibody EIA was high positive. Daniel was started on itraconazole after the bone biopsy was taken prior to receiving the results back , as the suspicion for blastomycosis was high. He was treated with generic itraconazole at 5 mg/kg PO once a day. His lameness started to improve within about 2 weeks after starting this treatment and the pain relief medications that he had been on, were gradually discontinued. Daniel was treated with itraconazole for a total of 8 months. We treated him for 1 month beyond the point of when no further improvement of the boney lesions on the radiographs, could be determined. His urine blastomycosis antigen level had returned to negative prior to this time. Daniel is now about 2.5 months out after finishing the itraconazole. His first recheck urine antigen level was negative. So far, he is doing well. His urine blastomycosis level antigen test will be performed again at 3, 6, 9 and 12 months after he finished the itraconazole, as relapse of the blastomycosis is common during the first year after finishing treatment. Repeat knee radiographs will also be taken intermittently over this coming year, to make sure that the boney changes remain quiescent. Blastomycosis is a diagnosis that is being made more frequently in Vermont and upstate New York over the past several years. What is interesting about Daniel’s case is that he presented with lameness in just one leg and he was not systemically ill. Initially, the only change in him was a swollen, painful knee joint with neutrophilic inflammation in that one joint, with no radiographic changes for the first 2 months of his lameness. We have seen several other cases that presented with neutrophilic inflammation in one joint with or without radiographic changes, that ended up being diagnosed with blastomycosis. Cases like Daniel’s make us realize, that we need to have the differential of blastomycosis on our rule-out lists for many cases that present to us. Classical presentation of blastomycosis in the lungs (snow storm effect). The diagnosis is often straightforward by performing the urine blastomycosis antigen test. Sensitivity of this test is over 90%, but false negatives do occur, and we have seen these negatives several times at Peak. If the urine antigen test is negative, consider cytology and/or histopathology as these techniques are considered the gold standard method for diagnosis. Antibody detection can also be used in antigen negative cases, as we performed in Daniel. The sensitivity of the AGID method has ranged from 17% to 83% and experience in clinical practice has been unfavorable. The sensitivity of the EIA method is superior to AGID, supporting its use as an aid in the diagnosis of blastomycosis in antigen negative cases. We have seen many cases being treated successfully after the blastomycosis diagnosis. Blastomycosis in the lungs or in the central nervous system, has a higher chance of an unsuccessful treatment. There is evidence that longer treatment may reduce relapse. Relapse rates of 18-25% are listed in the first year after finishing treatment. Recommendations have been made that at least a four to six months course of itraconazole should be given to reduce the likelihood of relapse. At Peak, we recommended continuing therapy one month beyond resolution of all clinical findings, including eye exam, chest radiographs or bony changes, and one month after the urinary antigen was negative. We then check urine antigen levels at 1, 3, 6, 9, and 12 months after finishing treatment, to make sure we catch a relapse of the blastomycosis prior to the development of symptoms.